The internet today, has a lot of people are blogging and vlogging about different fields and topics one them being cooking. Which have made people interested in experimenting with their cooking skills and taking things to the next level. People have started making a variety of foods which needs baking, preparing less oily food and snacks. And for these recipes they need a microwave oven which was not a requirement in majority of Indian kitchen a few years ago. And to help people with a sweet tooth who definitely need a microwave to prepare pastries and variety of cakes, we have compiled a list of the best microwave oven in India with price to give you the baking advantage. The best microwave oven that we have tested and reviewed are with their features like temperature settings, pre listed menu, different power levels and warranty. 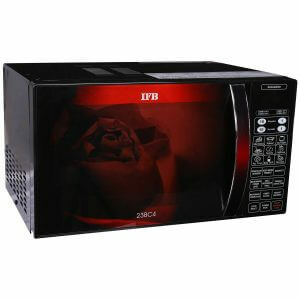 If you want to prepare restaurant like food at home with the same detailing then a microwave is must for you. And to help you get the right product that perfectly fits into your budget then you are at the right place as we have compiled the list of the top 10 convection microwave ovens for you. Happy Shopping! Keeping in the mind the aspects such as usability, design, and price this model can be considered as the best convection microwave oven in India. IFB is a reputed brand in the consumer electronics space and so, we decided to review this microwave oven. This microwave is loaded with exciting features like defrost and fermentation which will help you to try a variety of food ideas. This convection microwave oven has a capacity of 23 liters which is ideal for Indian families and the power consumption is moderate without making a dent in your budget. This has multistage cooking which keeps food warm for longer period of time, and the defrost feature helps with frozen foods. there are three modes, which is microwave, grill and convection mode. This oven has up to 10 power levels and the temperature can be adjusted to a maximum of 220 degree Celsius. It also has ten temperature levels with different settings for different type of food which requires being heated. It has a special feature called weight defrost which defrosts food based on the weight of food. The inner shelf is made of stainless steel and the user interface comes with a nice LED display. This model features 71 auto cook options. The oven is designed in such a way that the grease will be eliminated by the steam created in the microwave. IFB offers a 1 year warranty on the overall product and they provide 3 years warranty. The 28 Litre microwave oven by LG has an amazing design. The more number of features it provides justifies the higher price of this product, the price is mainly higher because the capacity is on the larger side. So, let us get into knowing some of the features this microwave has to offer. First, the important aspect is the size, with most of the Indian homes having 6-10 members this microwave is a perfect match. For the capacity, it offers the power consumption is actually efficient at 3100 watts. Stainless steel cavity enables better reflection and uniformity of heating inside the core of the oven. Comes with 12 Indian roti recipes which you can cook with a single touch of a pre set menu. The auto cook menu comes with 251 cooking options and includes 175 Indian recipes. The overall design is ergonomic and surely adds a premium look to your kitchen. The quartz heater in the Oven eliminates the risk of any form of hand injury and thus making it absolutely safe for cooking. It comes with 1 year warranty on product and 5 years warranty on magnetron from LG. IFB is a household name when it comes to microwaves and they are considered to be the best microwave convection oven under 10000.This particular model of microwave comes with a host of features which is enough for you cook any kind of Indian/ foreign recipes. Comes with smart features like auto clean, child lock, auto menu, reheating, defrost etc. Here are some of the specifications which will help you get an idea about the product. The oven has a capacity of 20 litres which is ideal for small sized families and bachelors. The operating voltage is around 230 volts and isn’t a heavy power consumer. It has a combination tech feature which has two modes i.e grill+microwave and convection+microwave. It is able to defrost frozen food within minutes with its speed defrost feature. Also comes with multi-stage cooking along with 101 preset cooking menus. You can also make use of other function like express cooking, reheating and deodorizing. The child lock safety feature ensures that your child can be around the kitchen without affecting the working of the oven as it is smartly locked. The design is quite good and can match any type of kitchen, the touch display makes the experience of using this oven handy. If you are looking for an oven for small sized small families under Rs. 10k then this Electrolux microwave oven is the ideal choice. A constant level of power is provided by smart ware technology which then eliminates overcooked edges, cold spots. This also helps cook food uniformly keeping the nutrition intact. Any stains which are formed during cooking are cleaned without much effort with the 360-degree clean system. This product ensures you will stay worry-free about quality and reliability as the oven comes with a 3 years warranty. Here are some more features you need to know before buying the Electrolux oven. Capacity is the most important factor as it decides how much food you can cook/ bake, this microwave comes with a decent capacity of 23 liters. Power consumption is at 1350 watts which is similar to other ovens in this capacity range. It also Comes with a special feature called tandoori heater which makes your tandoori delicious. Smart wave technology ensures efficient use of power. This model comes with 501 pre-programmed auto-cook menus to satisfy your taste buds instantly.It is very ergonomically designed and has a pretty decent styling. The convection microwave oven from morphy richards has a stainless steel inner frame, which makes the interiors stain-resistant, saving your time in the cleaning of the oven. The inside cavity does not have any sharp corners and is round in design which prevents food fragments from depositing in the corners and any injury while cleaning. A high-speed fan system ensures a good distribution of heat across different areas of the oven. And besides this, there are other options like auto defrost options, child lock system to avoid any problems. This is idlefor small families with 3 to 4 members. It has five power settings depending on the level of heating you want. This depends on the food you want to cook or heat. Also comes with 5 auto cook options were the settings are pre programmed. The special convection technology makes sure that there is uniform cooking. This product comes with a warranty of two years. It has a over heat sensor which ensures that the microwave goes off in the case of any malfunctioning during cooking. Kenstar is a reputed Indian brand when it comes to kitchen appliances, let us have a look at their new convection microwave oven. The first look at the product confirms that this microwave surely has some awesome features. The antibacterial cavity keeps the food hygienic every time and reduces bacteria growth. The microwave can store up to three cycles of cooking simultaneously, therefore, keeping your cooking process convenient and time efficient. This microwave is suitable for a micro family as the capacity is only 20 liters. Comes with the digital job wheel which allows you to switch between various options easily. The express cooking feature allows the food to be cooked quickly without ruining the taste. Comes with safety features like child lock and overheating notifier. cooking 150 recipes is an easy job as it has 150 preset menu ideas. The Lemon clean function ensures that you remove inner cavity stains just by heating lime in a bowl of water. It is priced under 15k which makes it a decent purchase of 25 litres capacity. 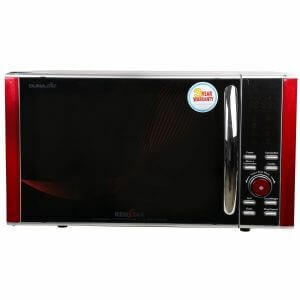 Also comes with a 3 warranty for magnetron which is the main part of a microwave oven. This Samsung convection oven is not only amazing with its looks but, also extremely good performance wise. It is smaller in capacity and is enough for a family size of 3 or students. Comes with a touch pad which looks much better than buttons. Its unique design makes it a fit for any kitchen space. The triple distribution system ensures that the oven is energy efficient. 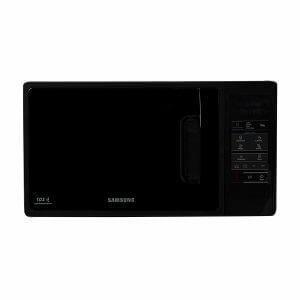 Samsung has provided a rapid defrost feature in this which helps in saving time. The little hands of the kids in your house are safe as this Samsung convection oven comes with advanced child lock feature. Its wide door makes it a good design and the blue LCD enhances its look. 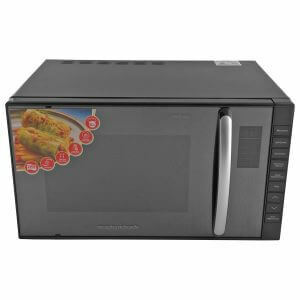 If you are looking for a convection microwave oven around 5000 rupees then it is a value for money. It also comes with a warranty of 1 year which can be extended further. Bajaj is an upcoming brand in the Indian electronics space and is coming with multiple products.We have revieved the bajaj grill convection microwave oven and what it has got to offer to the Indian customers. 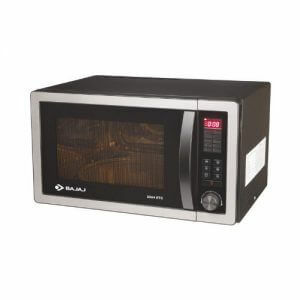 This bajaj microwave model has a capacity of 25 liters which is enough for small to medium sized families. It comes with both convection and grill mode. 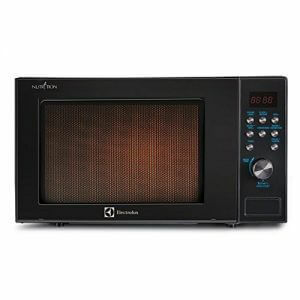 The black color gives a premium look to the microwave and the stainless steel ensures easy cleaning of the inner cavity. Multiple power levels are provided with efficient electronic control. It comes with a digital timer, keep warm function and also steam clean feature. It is quite in the budget as it is under Rs.10000 which includes installation as well. LG is a reputed player in the consumer electronics space for a long time now. They have been selling a wide range of products from televisions to microwave ovens. The 28-litre capacity is enough for families with 5 to 6 members. The stainless steel cavity helps in uniform cooking as it provides a better reflection of heat inside the cavity. The total power consumption is 3100 watts which are on the higher side which is parallel owing to the capacity. It has two heaters on the upside and rear which helps in quick heating with the active heating feature. This includes many recipes which are especially designed for health conscious people. The concealed heater ensures that you will not suffer any injuries while operating the oven. 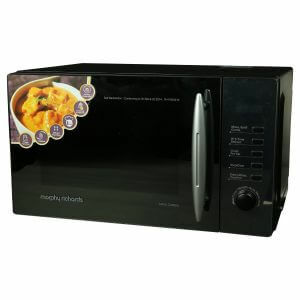 This is a good option if your budget is under 15000 rupees, you will also get a complete product warranty for 1 year and 3 years warranty on magnetron as it is the main part of the microwave. This microwave oven is equipped with a multi-stage cooking feature which lets you cook and grill the food separately. With its mirror finish control panel, you can choose the perfect setting for any given dish. Food taken out from the fridge can right away be put to defrost using the special defrost feature. Comes with a starter pack which allows you to cook straight away as soon as you receive the product. As the capacity is low the power required to run this is too low at 800 watts and The input power for grill mode is 1000 watts and for microwave-mode is 1270 watts. Has a multi-stage cooking feature which allows cooking food at different heating levels in one shot. Comes with beautifully designed mirror glass door and makes a perfect addition to your kitchen. This is a good budget product for around Rs.7000. We are sure that you must have made a decision for the right product from the list above as these are the top 10 convection microwave ovens in 2018 based on budget, user experience and customer satisfaction reviews. So, go ahead buy the best microwave convection oven and do share your buying experience with us in the comments below to help us do better.